I’ve been regularly seeing yet another acacia on my strolls in and near town–on the mesa above Brighton Beach, along the Palomarin trail, on the back streets of Inverness. I first noticed this plant for its flamboyant seeds. When the pealike seed pods split open later in the year, they will reveal a shiny black seed surrounded by a wild curlicue of orange ribbon. I hate to love an invasive, but I think they are just beautiful. 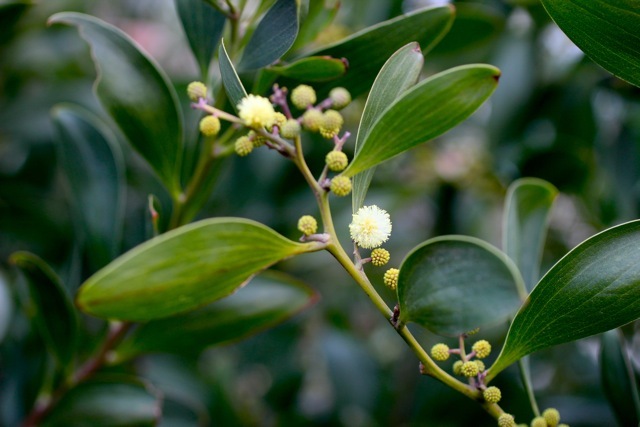 At this time of year, the blackwood acacia (Acacia melanoxylon) can easily be identified by a quick look at its leaves and flowers. It has occurred to me that identifying acacia species is sort of like winning a game of Clue: but instead of people, rooms and weapons you mix and match flower and leaf type until you come to the only possible answer. 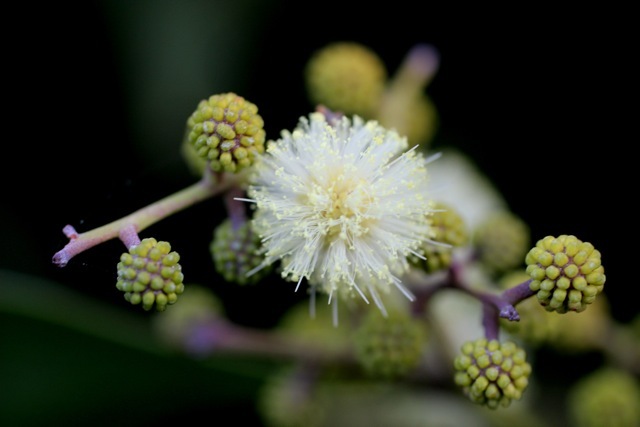 So: if you’re looking at a small tree that has yellow pom-pom-like flowers as well as blade-like leaves that each have four prominent veins on them, then you are looking at a blackwood acacia. But walk down the street and it’s time for another round! A different species of acacia I saw around the bend from the Blackwood acacia had blade-like leaves with bottle-brush-like flowers–so clearly it is golden wattle and Miss Scarlett didn’t do it.